Pilot Delivers … and That’s No Bull! Winnie the bull had quite a ride from Winnipeg, Canada, to Collinsville, Texas, and Pilot’s shipping specialist ensured he made it safely! 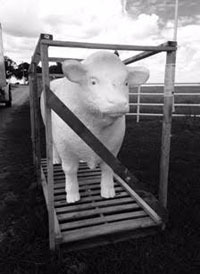 The fiberglass statue of a Charolais bull was purchased by J.R. Martin to adorn the entrance to her ranch, where she raises the real version of the special cattle. Winnie, named after the city of his creation, measures nine feet long, five feet tall, and three feet wide. At 125 pounds, it wasn’t the statue’s weight that posed a shipping challenge, but rather his awkward shape. With the just the manufacturer’s rudimentary crate made from a pallet and posts, Pilot and its partners made sure the unusual cargo made the long trip to his new home without incident. As you can image, when Winnie arrived on the dock at Pilot DFW, he immediately stirred up conversation.